Flooring colour can be the most challenging and demanding selection for the interior of people’s homes. Timber flooring is placed throughout the home these days and in the most habited places within the home. Matching in kitchen cabinets, splashbacks, bathroom tiles and wall colours with a timber flooring colour can be a bit daunting. Dark colours: the old saying still rings true…the darker the colour the more dust, etc can be seen. With matt finish oak this has become less prevalent and we have seen an increase in the take up of dark coloured oak flooring installed and our clients have been very happy. Dark oak timber floorboards can also be reasonably easy to repair if you have a scratch or even a deep gouge. Light colours: A trend towards lighter floors recently have be driven by people wanting to add more and more sense of space to their homes. Light floors can definitely do this. Some thing to also consider when looking at having light colour floors in your home is that if you already have a very light house the light floors can make your home possible feel cold and a little clinical. Very light floors can also be prone to showing dark scuff marks more prominently, but having a matt finish oak timber floor can allow you to repair the scuff marks etc with white/light colour repair oils. Mid tone/brown colours: Recently the natural or mid tone colour floorboards have been making a comeback. With white / black bold kitchen colours some people have been opting back to natural (mid tone) colour timber floorboards. This colour range can allow the homeowner have more choice of other building products/furniture colours that will complement their mid tone floorboard. Also, the mid tone oak floorboards we have available we find the easiest to spot repairs and to keep clean. Grey colours: Almost every second person that works into our showroom will ask to see a grey colour floorboard. We have over 30 different grey colour soak floorboards. And people idea of grey can be as varied. However, we have found that most people looking for a grey colour oak floorboard have a definite style in mind that their grey flooring will complement. Other that aren’t as sure tend to tip back into the safe waters of mid tone colour oak floorboards. 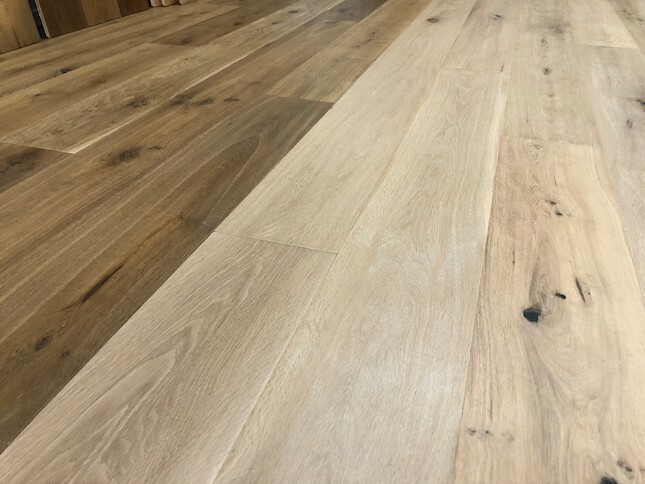 The world of choosing an oak timber flooring colour for you can take many hours of research and even more hours in store visits. We have over 120 oak flooring colours in one large showroom, with sample panels you can take home to really help you decide which colour will help you create your home. Contact us today to see how we can help you beautify your home.